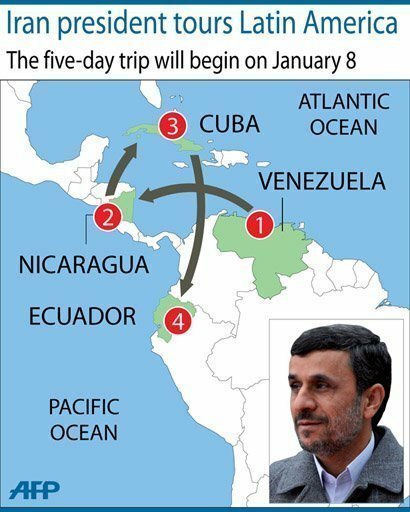 Iranian President Mahmoud Ahmadinejad, facing new sanctions over his nation's suspect nuclear programme, landed in Venezuela on Sunday to start a five-day tour aimed at shoring up ties in Latin America. Ahmadinejad will meet fellow US foe and firebrand Venezuelan President Hugo Chavez during a four-nation trip that coincides with rising global alarm over Tehran's reputed attempts to build an atomic weapon - a charge Tehran denies. "We are not a threat to anyone. We have sovereign rights," in an implicit jab at the United States' stated concerns about Iran and Venezuela.